None, really, except what I describe. Prices here are still catching up to the rest of the country. Yes, I agree that it’s a bargain, but only if this is what you’re looking for. 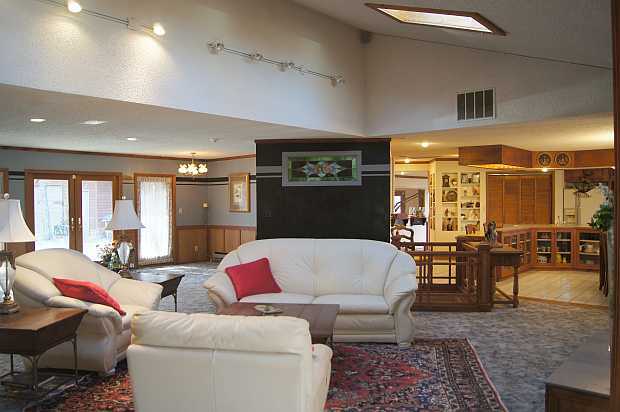 The 31-acre retreat was agent listed for $699,000 in 2012 ($740,000 for the 41-acre package). Please read my ramblings about my adventure, the property, the area, and the lake before you decide. I’m betting you’re eager to click on the next section and learn about the property. But let’s hang out together for a few minutes. I’ll share some insights about my decision to move here and give you an overview of the happiest adventure of my life. And now, after 11 years of withdrawing from the spotlight and becoming a virtual hermit in a retreat I only intended for getaways, it’s time for me to make public appearances again. I’ll also assist the poker industry with methodologies I’ve developed during my wonderful, life-changing seclusion here. I’m not leaving the Ozarks entirely. I’ve moved in with Diane, just six miles away on the same lake. Let me tell you about everything. When the adventure began, I’d been looking for a getaway house on a lake. Something simple. So, I began scouting the Internet for possibilities. I lived with my then-wife Phyllis who was a prominent casino manager in Los Angeles. My life as a casino consultant, poker theorist, lecturer, author, and player had led me to be widely known as the “Mad Genius of Poker.” But, after 30 years, that lifestyle no longer offered the excitement for me that it had previously. I spent much time in my office, surrounded by computers, doing research and writing. And it occurred to me that, hey, I can do this from anywhere. I remember discussing this at a poker table in the Hollywood Park Casino, when remarkably everyone else at the table shared my vision. They all wanted to occasionally dissolve into quiet surroundings and chill out. So, I convinced Phyllis and began the search. Several key areas with lakes looked most promising, including one in South Carolina. But when I had factored in everything, one lake stood above all others. It was Table Rock Lake in the Ozarks — mostly in Missouri and partially in Arkansas. The lake is huge, with about 800 miles of shoreline. You had seasons, like I wanted, but they weren’t too extreme. And, for me, the best part was that it wandered with larger coves leading to smaller ones and wasn’t very wide across, except in a few places. I love shoreline and as a kid I spent summers at my grandparents’ house on Lake Travis near Austin, Texas. Most of my days there included walking the water’s edge and fishing from boats that were never far from shore. The shore was where it all happened. It’s where you can watch deer that come to drink and do the best fishing. I know many people like oceans and prefer to be far away from shore, but for me it’s all the same out there. A shoreline is what defines a body of water. After a quiet drive of almost half a mile through the forest, over a bridge, and along a park-like approach, you can see the complex just ahead. And some lakes, like Lake Mead near Las Vegas, where I’ve spent a lot of time, have shorelines that are pretty barren. As soon as I researched Table Rock Lake, I knew this was my lake. There was beautiful forest along most of the shore. Some areas of the lake were more heavily populated, with small lots and houses right next to each other. That’s okay, too, but not what I wanted. I noticed many areas of the lake where there were few houses. Some were that way because there was national forest. There wasn’t much to choose from that offered the kind of hermitage I was seeking. But I finally found a one-of-a-kind place on Table Rock Lake. It began with a flight to Springfield, Missouri to meet a real estate agent who had settled in the Ozarks from Chicago. Phyllis and I had already visited the area to look at dozens of potential properties. We liked many of them, but none offered the seclusion I was seeking. So, I half settled on one in a small lake community. Interestingly, it was owned by Diane and her husband. Now, 11 years later, Diane (my director of operations) and I are both single again and have gradually grown more and more comfortable with each other. 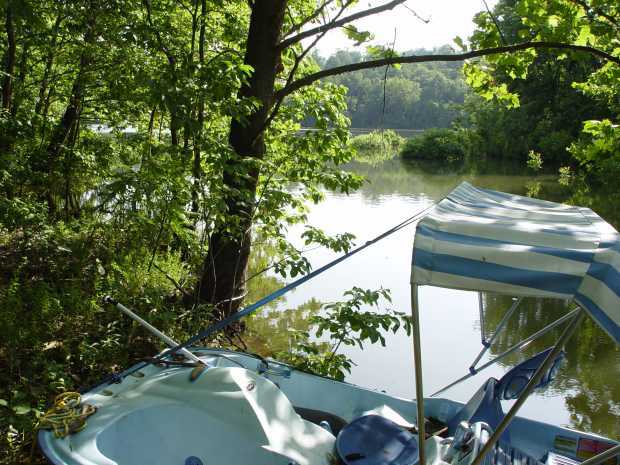 A few years ago, she bought a house on the lake six miles away from the property I originally purchased. And a year ago I moved in there, leading to my eventual decision to sell my retreat. But that’s getting ahead of the story. I’m just rambling, trying to convey things in the order they occur to me. Please follow along, and I’ll tell you about how my life was changed for the better by the Ozarks. It’s a story of deep solitude, friendly people, personal discovery on a lake surrounded by paths, and even cows that came to visit. Anyway, I was only willing to purchase Diane’s original house if I could acquire the acreage next door. And my attempts to do that failed. So, no go. The real estate agent that Phyllis and I had befriended continued to look. But he knew what I wanted and warned that there might not be anything like that on the lake. He kept sending photos and telling me why the properties weren’t right for me. After weeks, I realized I was dealing with the world’s most ethical real estate agent, so when he called to say, “This is the one,” I took it seriously. Before I tell you about a strange glitch I encountered while purchasing the retreat, let me skip ahead a bit to a month after I arrived. Being from the city, I decided the quickest way to impress visitors would be to decorate the house with artwork, bronze statues, and antiques. I thought these “conversation pieces” would break the ice with neighbors and locals who might be wary of me as an outsider. I was wrong. The people here are friendly by nature and you don’t need to stimulate their friendship. Also, while out of town guests and new arrivals to the Ozarks were intrigued by my decorations, the locals mostly talked about an antique rifle I had on display, hanging in front of a mirror by my office. You won’t need to impress anyone here. People accept you for what you are. Inside the entry, I placed a huge cut-class vase that was hand signed by the artist. I’d acquired it at a local auction for $700, realizing that it would sell for much more in other areas of the world. You can often find great bargains in the Ozarks — sometimes for under $5. 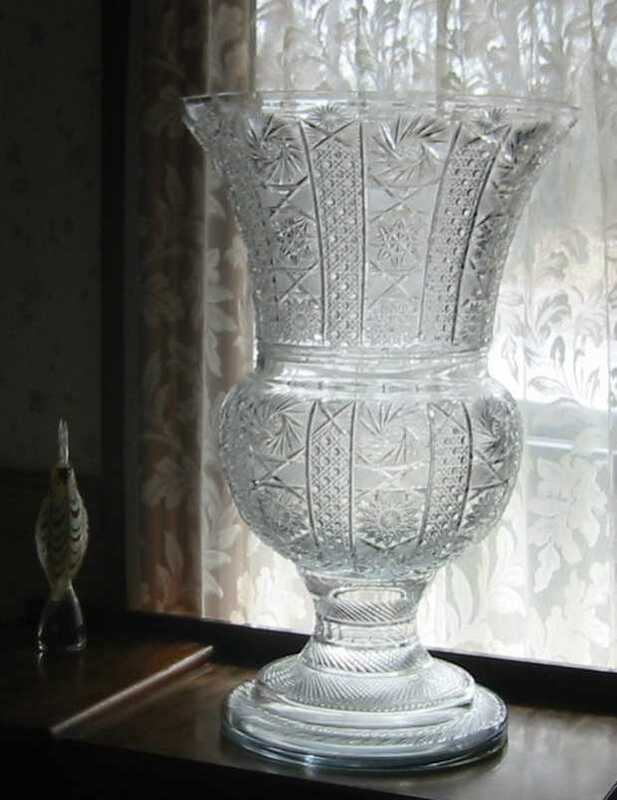 Sadly, the vase never stimulated any conversations about it with the locals. Back to the purchasing phase. Phyllis and I decided to buy the property based on the agent’s description and the photos he emailed. The house wasn’t showy like ones we might consider in the city, but it had charm. And there was 31 acres of yard and forest, plus plenty of lakefront. I told him to buy it, sight unseen. They wouldn’t let me buy it! That led to my first encounter with an Ozarks culture that I wasn’t accustomed to. The broker my agent worked for refused to sell it! I would have to leave my busy schedule in Los Angeles and return to the Ozarks to make sure I wanted what I had already decided to buy. I told the agent not to worry, I would take care of it. I faxed a document I hastily wrote to the broker, saying we wanted to buy the property at the full asking price or anything less that could be negotiated. And I would be satisfied with the purchase, “even if it turns out to be wholly different from what I perceive it to be.” That did the trick. 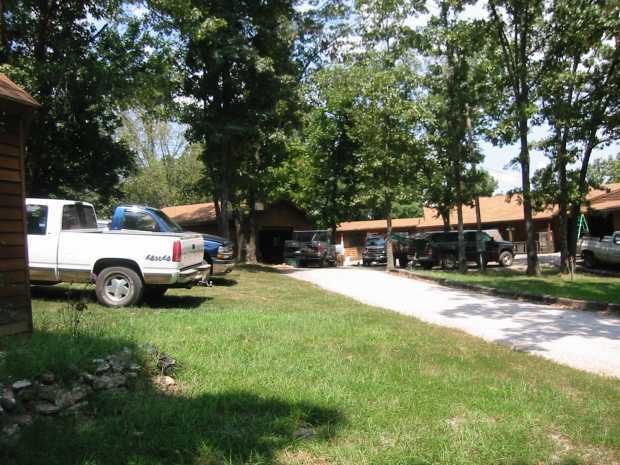 I was allowed to buy property in the Ozarks. Just because I was in training as a hermit in the Ozarks didn’t mean I never had guests. 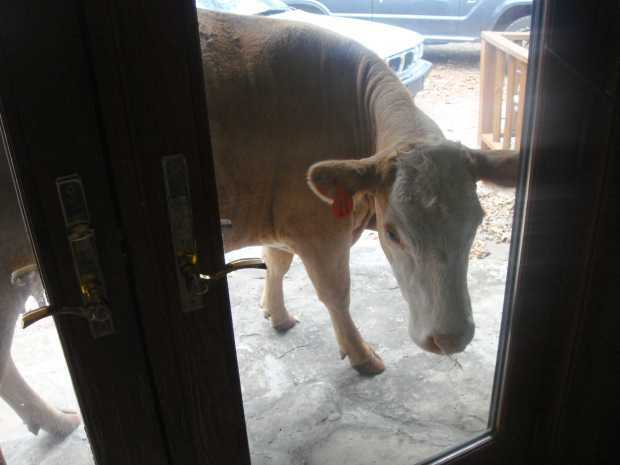 A few years ago, there was a knock at my door and I found a huge cow peering in, as you can see in the photo. Cows had escaped from a pasture nearby. Life in Los Angeles was never like that. In the next section about the property itself, you’ll learn how it exceeded expectations enormously, when Phyllis and I first arrived to inspect what we’d purchased. What a happy surprise! So, what else floods my memories? This… A few months after a visit to inspect the property, which I had already purchased, in 2002, I decided to pack some things into my 1990 LandCruiser, drive the entire way, and perhaps stay for a week or two. The drive was pretty comical. The LandCruiser, which I’d purchased new 12 years earlier, was a prize sentimental possession. I couldn’t bring myself to sell it and get something newer. It had used its athleticism to take me and Phyllis to many remote areas that couldn’t have been visited by normal car. And it had never broken down — until its exit from Los Angeles. I can’t remember the exact issue, but I think a belt broke and the SUV that I named Elsie (L.C. for Lancruiser) overheated and needed to be towed to a nearby gas station that provided car repair. Elsie was packed full of clothes with computers hidden beneath, a large parrot cage intended for future visits of our Cockatoo that we called Powder, and miscellaneous junk I had stuffed in the folded down rear portion and piled high on the passenger seat. I was dressed down for the trip, and I’m sure I resembled someone migrating to California during the dust bowl, rather than the way I viewed myself as a semi-famous and successful poker personality, writer, and consultant. And the cabin next door offered a completely different escape from my city existence. And it was quickly apparent that if you don’t look the part, you’re treated differently. I had to “accidentally” flash hundred dollar bills while getting keys from my pocket to regain any stature with the mechanics. The final, “Have a good trip, sir,” as I was leaving hours later let me know I had at least partially succeeded in rescuing my dignity. I planned to make the drive to the Ozarks in three days, driving about 600 miles at a time. But I couldn’t wait to get there and covered almost the whole distance in one 26 hour session, stopping in Tulsa late at night, because I didn’t want to be in the forest before the sun rose, searching for the key the previous owner had left. The next morning, I arrived. Waiting for me was a large pontoon boat I had purchased from Diane and her husband. It was about the only thing I owned in the Ozarks so far, plus what was crammed into the LandCruiser. The house was completely unfurnished, except for the handmade dining table and chairs I had purchased from the previous owner, who had made them. And that’s how my great Ozarks adventure started — with the intention of staying a week, not realizing I would never leave. This “hidden” cove is completely surrounded by the property and gets few waves (which is also true of the main lakefront here). It’s perfect for launching paddle boats. Mine is actually electric. But I’m not always lazy, so I sometimes use the peddles, instead. The real estate agent I had befriended visited me on day one. He asked if I’d brought any guns. When I said I hadn’t, he left me with two rifles, a scary-looking, semi-automatic and one that had been standard issue in World War II. When I asked whether it was dangerous at night, he seemed baffled and assured, “No. This is an extremely safe area.” And I quipped, “Well, shoot.” He laughed. I would soon realize that guns were just an accepted part of life here. Not everyone owns them, but most people do. I set up my computers on the first day, using the breakfast counter and a chair borrowed from the dining room table that I’d purchased with the property. Since, it was my only furniture so far, I slept on an inflatable mattress. The night sounds were incredibly soothing. Now I’ll provide a few more observations about my 11-year adventure here. At first, I would go more frequently to Branson, about 40 minutes away, and take in the shows. Many of the 55 or so theaters are devoted to country music, and the performances are remarkable. There are also fifties and sixties musical reviews, river dancing, comedy, magic, and more. What I noticed about all these theaters was that there was no valet parking. I learned this by pulling up to the main entrance the first time and waiting. And waiting. And waiting. Finally, I just found a parking place like everyone else. And I soon discovered that you couldn’t buy the best seats, either. The concept of different prices for various sections hasn’t occurred to anyone here. It’s one price. But the good news was that when I tried to offer money for front row seats, a bribe that always works for me in Las Vegas comedy clubs, my money was rejected. But wait! I got the seats, anyway. Feeling terrible about my boorish big-city behavior being inappropriate in the Ozarks, I returned to the cashier after the show, dropped the money on the counter and walked away. I had learned a lesson about the culture and knew my money would have once again been politely refused. My first project was to convert an attached workshop, creating a new suite with a large office area, closet, an outer waiting room, an extra one-and-a-half bathrooms, and a balcony. 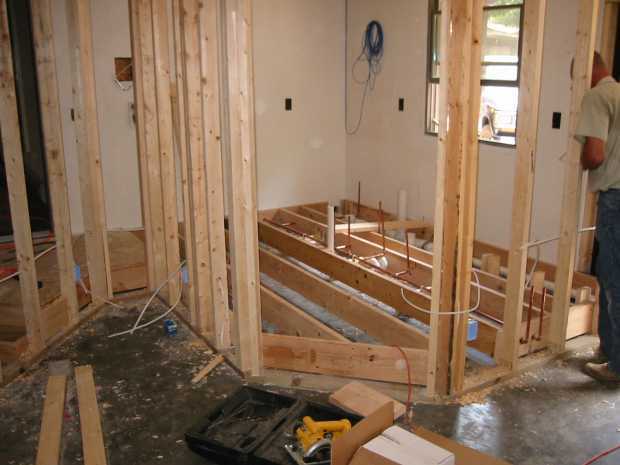 One bathroom during construction shown here. Although this served as my primary office, it’s perfect for use as a second master bedroom suite. Here’s a tip. Simply call the theater to reserve seats, saying that you’re entertaining out-of-town guests (which was true whenever I did this) and mention that you know all seats are the same price, but can they work some magic? This will get you front row center, if available. Nowadays, I wouldn’t even be comfortable bribing my way into special treatment in Las Vegas. That’s how much the Ozarks has changed me. Where was I before I got sidetracked? Oh, yeah, valet parking. Not only do the theaters not have it, even the best restaurants don’t, either. So, this brings me to my trip to Silver Dollar City, a premier theme park half an hour from the property, a year or so after my arrival. There was a slow moving line of cars entering, adding another half hour to the excursion. About halfway through the line I see this big sign that says something like: “Priority parking $10; Valet parking $20.”. And there’s an arrow pointing to an empty parking area. So, I immediately turn into it. There I’m greeted by an incredibly friendly man, who works for the theme park, informing me that there’s no parking in that lot. I explain that I had turned because of the sign and he says that they probably have those services some days, but he doesn’t know anything about it. So, I have to return to the main road where another polite employee only lets me turn in the other direction of the flow of entrance traffic, because I’m exiting a parking lot. I explain what had happened, but he tells me I’ll have to go back to the end of the line. I comply, because causing friction is not the norm here in the Ozarks. So, what I learned is: Not only is there no valet parking, you get punished if you even ask about it. I witnessed as many as eight trucks present at one time, as workers hurried to complete my various projects. I’m not religious, although I’m still searching for truth and don’t deny the possibility of anything. One of my best friends, the legendary world poker champion Doyle Brunson, has been trying to save my soul for decades and maybe one day he’ll succeed. Meanwhile, I at first felt a bit out of place in the Ozarks, because there are so damn many churches. Yes, I hear you, unfortunate word choice in that context. I meant “… dang many churches …” My bad. Before you judge me to be a heathen, please read my blog entry: Sitting out Easter in the Bible Belt. Since I had plenty of places for workshops, I didn’t need the one beyond the plain-looking door where the main house ended. So, I had the entire doorway expanded and left open, with a step-down into the new suite, shown under construction in the background. 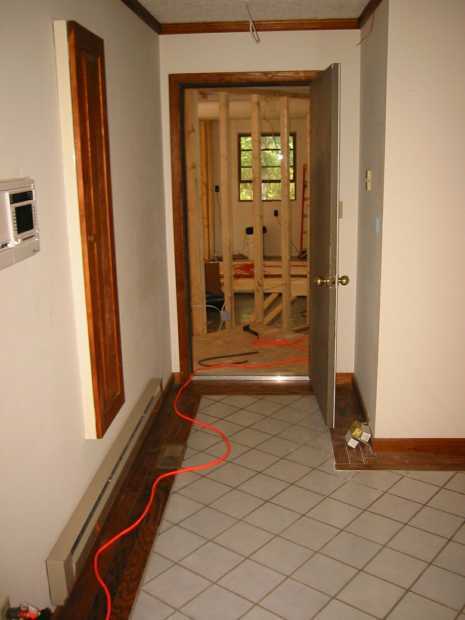 I had the door removed that lead to the boxy workshop at the end of the home’s previous living area. 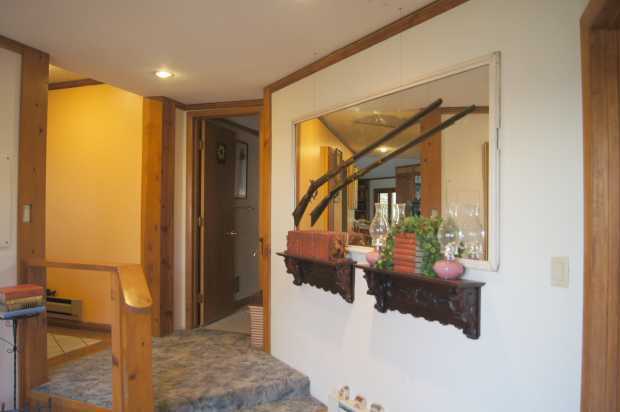 I also had the doorway expanded from wall to wall and left doorless to mirror the open feel of the rest of the house. I designed angles to completely disguise the old box layout, dividing the area into a large inner office and an outer area for sitting, relaxing, or dining. The landing you see here is a step-down to the outer area and a new second balcony. The doorway to an added half bath is also seen here. Actually, my office was designed to potentially be a second master suite at the opposite end of the house, having a closet, a full bathroom, and double doors, as you’ll see in the other sections. If you’re curious about the rifle hanging in front of the mirror, it’s a flint-lock from the 1860s that I won at auction. Despite the fact that I decorated the house with artwork, antiques, and bronze statues as conversation pieces, the only thing most long-time area residents talked about was this gun. Just to drive home the reality that I was no longer living in the Los Angeles suburbs, I quickly attended my first auction. And it began with a prayer. I hung my head along with all others, pondering one of my earliest WTF Ozarks moments. But, you know what? My culture shock didn’t last long. These were really quality people, and I began to fit right in, bidding and winning items that would sell for thrice in California. And then there was the really big shock. I was allowed, as a stranger, to take my purchases to the car as I added them, being fully trusted to pay whenever I decided to leave. Clearly, I was a long way from from the big city. 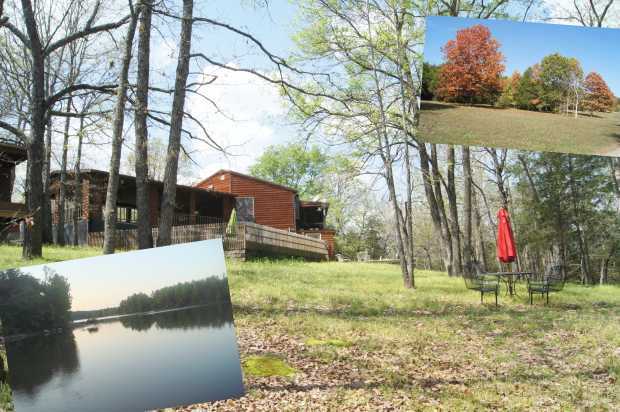 I was enjoying my new anonymity in the Ozarks when I was discovered to be a new resident by 417 Magazine. There is, indeed, a large population of sophisticated residents with upscale tastes, and that super-glossy, thick magazine caters to them. They apparently thought it was intriguing that a well-known poker personality had moved in, so they rewarded me with a feature. Luckily, local fame didn’t last long and I quickly returned to practicing to become a hermit. By the way, 417 is the area dialing code here — thus the name of the magazine. I learned that Springfield, Missouri — the largest nearby city with a metropolitan-area population of about 440,000 — turned out to be more culturally aware than I thought. Last year I traveled the 58 or so miles to see a really great performance of Les Miserables with Diane. I’ve seen high-profile performances in Los Angeles and own the 10th and 25th anniversary DVDs, so I’m basing my comparison on that. If you rate those performances near 100, typical community performances at 50, and the latest movie adaptation at 55, then this scored about 95. Another Ozarks bonus for me. Springfield also offers surprisingly superior restaurants of great diversity. And the nearby area even had a Shakespeare festival recently, to compliment the normal fare of popular music, especially country and bluegrass. 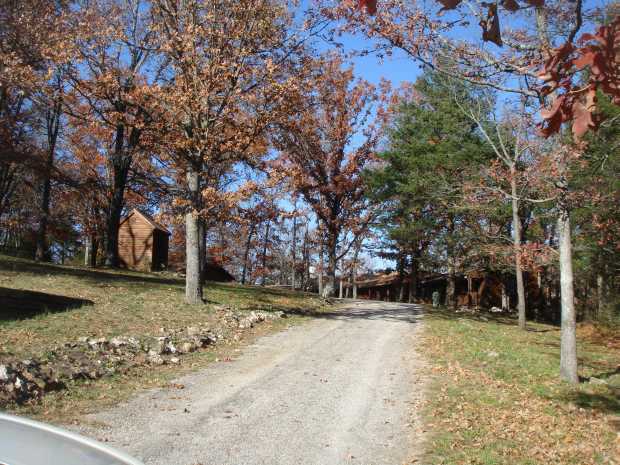 Whenever I traveled, I was eager to return to my home in the Ozarks. From this spot, the lake is off-camera to the right, the cabin is off-camera to the left, and in every direction, you can begin exploring the five miles of paths I had added. They wind into the deep forest. I’ll wind down this section by saying that I never intended to stay here permanently. My decision to remain led to my former wife and now great friend Phyllis initiating the most friendly and amicable divorce in world history. It was my fault. I just got lost here and liked being alone in my forest by the lake. My property won’t be a fantasy escape for everyone, but it has been for me. And I’ve enjoyed sharing some of my adventure with you. I grew up in the Tri-Lakes area, traveled, moved away and then back, here to stay now. I truly enjoyed your writings of your trip making our Ozarks your forever home. I love hearing that you are learning our ways and not working to change our trusting hillbilly ways. So many time population move here for the obvious glorious reasons and then they spend the next 30 years trying to fix us. Welcome to The Ozarks! have you sold yet Mike? I was born in Arkansas know the Ozarks well. I miss it. Thank you for refreshing my memories by sharing your story. All The Best….But Of Course…. Welcome back to civilization, Mike. Although a peaceful retreat is a wonderful blessing, getting things done requires the skills and facilities normally found in a metropolis. I look forward to having the opportunity to work together with you again, face to face. Incidentally, there’s a project I can use your help on right now. Please contact me if you are available, or not. I’m honored that you made your first comment here and officially joined our Poker1 family. For those who don’t know, Stan Sludikoff is the pioneering gambling publisher (and fellow Seniors’ Poker Hall of Fame member) who founded Gambling Times magazine and currently publishes the widely distributed Poker Player newspaper (online edition — http://www.pokerplayernewspaper.com) for which I write the front-page column. Stan, I didn’t say I was returning to the metropolis. 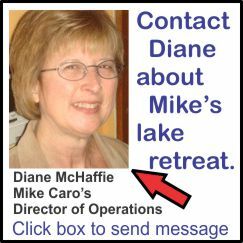 In fact, I simply moved six miles away to live with Diane on the same lake. I am planning to make public appearances again, though.